Very sadly, Niunia died recently—I think she was only 2. They just aren’t with us long enough. 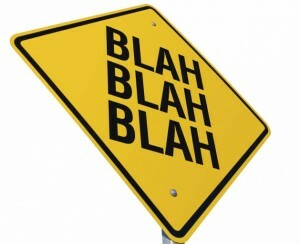 Training Tip: Don’t Yammer! Don’t Yell! My first goal when I began teaching our dog Saffron commands was to keep her safe, so it was really important that she paid attention to me when I talked to her. I knew someday it might save her life. So first, I trained myself to not do anything that would cause her to not pay attention to me. This is an easy mistake to make and I see it all the time. 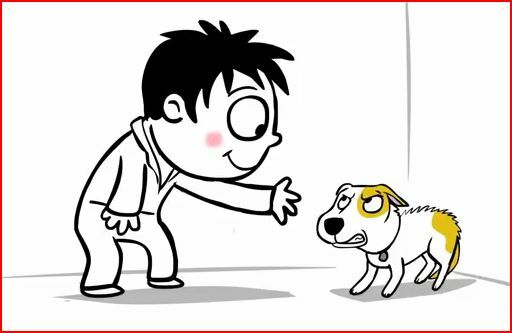 The person tells their dog to “sit” and when the pup doesn’t, the person keeps repeating “sit”—all the while, getting more and more frustrated. Unfortunately, what they’re teaching their dog is that the command isn’t “sit”, it’s “sit-sit-sit” or even “sit-sit-sit-sit-Rover-sit-sit”. So stop flapping those gums and just give the command once. If Saffron doesn’t do what I ask, I give her a cue that she missed it. (We use “whoops!”.) And I wait. If she still doesn’t do what I asked, I get her to refocus either by getting her to move or by moving myself. For instance, I wanted her to sit before we ever crossed a street because when we first got her, she would walk right into the street if I wasn’t paying attention. We would approach a corner, I’d stop & say “sit” and I’d wait. If she didn’t sit, I’d say “whoops!” and I’d wait. If she still didn’t sit, I’d get her focused again by turning us away from the street, walking in a small circle, and then approaching the corner again and say “sit”. You can also move into your dog’s line of sight to get their attention. Don’t jerk them or grab their face to get them to look at you. When you’re at the dog park or out walking your dog, don’t keep blathering on to your dog about everything, about how cute they are, about how you want them to behave, blah, blah, blah. I certainly don’t mean don’t speak to your dog. I mean put a cork in the verbal diarrhea. If you just yammer on and on, your dog will start tuning you out, because she’ll quickly catch on that you aren’t saying anything of importance and anyway, that tree smells really interesting and that squirrel looks tasty, etc. This especially goes for repeating your dog’s name over and over again. You want your dog’s name to have a lot of power and meaning to your dog. If you say your dog’s name with urgency, you want your dog’s attention to snap to you immediately. Tip #3 Turn down the volume! This is one that came easily to me. I tend to be a quiet person out in public and don’t like to draw attention to myself. In the beginning when I was out with Saffron, I was self-conscious because I had a dog that was obviously terrified of everything. I felt like we were already a spectacle, so the last thing I wanted to do was draw more attention to us by firing commands at her. So I whispered to her. We’d get to a corner and I’d whisper “sit”. The result is she has to pay closer attention to me than if I’d been loud. It also means that if I do shout, she knows it’s serious. If I shout “leave it!” when she’s running towards a fight at the dog park, she puts the brakes on. I can count on her to pay attention because I’ve avoided giving her any reasons not to. Remember to think before you speak! Wow! Clever kitty and an incredible trainer—she’s 14 and in the Czech Republic. They’re both having so much fun, I love it! Training really adds to your relationship with your animals, whether they’re cats, dogs, mice, or whatever. Here’s Richie’s website. You can use Google’s translator to translate the pages. Training Tip: Manage, Manage, Manage! I was in Texas recently for a business meeting and the same day I arrived at my parents’ place, two black puppies also showed up at their doorstep. Lost or stray dogs always seem to appear wherever I am, so it figures I travel halfway across the country and end up dealing with stray puppies. 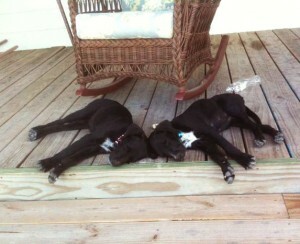 We figure they’re about 3 mos. old, 1 male, 1 female and were probably dumped by someone. They were malnourished and dehydrated. (My parents are in a rural area and lots of dogs get dumped or are just allowed to roam.) I figured I’d be helping my parents get them to a rescue group so they could be adopted. I think it had maybe been 24 hrs after they showed up that it became clear Bart & Sadie, as they are now named, had already found their new home with my parents. Yea! Now the process of integrating Bart & Sadie into their home started. My parents aren’t really dog people—they have 4 cats. They have inherited my grandmother’s Yorkie, CoCo, but she is nothing like these wild, semi-feral puppies. So I had to get those rusty dog-training gears going again in my head and fast! One of the most important things you need to do when you have a dog is manage their environment. This is especially critical when you’re teaching your dog what they can and cannot do. Dogs are explorers & opportunists and once they’re “rewarded” by some behavior, they’ll tend to keep doing that behavior as long as they get the “reward”. In this case the word ‘reward’ means anything the dogs really like—chasing cats, eating garbage, stealing dirty clothes—not a treat that you give them. So don’t lay out a banquet of temptations and expect your dog to resist. Manage their environment and set them up to succeed. For example, your kitchen trashcan holds awesome smells & tasty scraps, which your dog is likely to explore. If, in that exploration, your dog tips over the trashcan and gains access to those smells & scraps, your dog is “rewarded” by that access. The best way to keep your dog from learning they can get to the smells & scraps by tipping over the trashcan, is to prevent them from doing it in the first place by managing their environment. The level of management depends on the dog. Our dog, Saffron, gets spooked by things tipping over and loud noises, so our management strategy for the kitchen trash was a metal step-can with a close fitting lid—it’s heavy so less likely to tip over unless she’s really trying, the lid has to be lifted so she can’t just stick her snoot down in the can, & a close-fitting lid means enticing odors are less strong. Other dogs may need to have the trash behind a closed door. When it comes to managing a puppy’s environment, I think it’s best to assume the worst! They’re likely to get into everything. We immediately began crating the puppies & kept them closed in the utility room. Limited access to the house and being kept in a smaller space means they’re less likely to have accidents while house-training because of their instinctive aversion to eliminating in their “home”. Otherwise they’d learn the “reward” of emptying their bladder or bowels whenever they want. We removed shoes, a trashcan, things with power cords, and fishing rods to keep them from learning the “reward” of chewing on these things. We did underestimate them on a few things which met their demise—venetian blinds, a straw hat hanging 6ft off the ground, a yard stick We provided Bart & Sadie with suitable things to chew on instead. We put the pet food bins on a top shelf out of reach, so they didn’t discover the “reward” of chewing them open and eating the food. The puppies kept escaping when we opened the utility room door and were “rewarded” by getting to run around the house, so there’s now a “airlock” created by an ex-pen that encloses the door on our side. They may slip through the door, but they can’t get past the ex-pen. Bart & Sadie wouldn’t come when called yet and were being “rewarded” by getting to play, sniff, and find dead crabs at their leisure, so we started only taking them out on leashes. 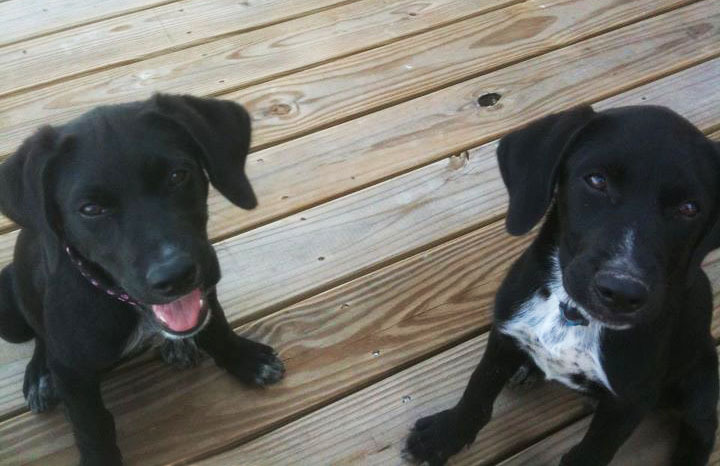 We didn’t want them to get the “reward” of chasing the cats, so we kept the puppies on leash when in the house. No matter what your situation, you can take steps to manage your dog’s environment. It takes some thinking, but managing like this makes teaching a dog so much easier. My parents won’t have to unteach chasing the cats or chewing up shoes, because the puppies aren’t having these unwanted behaviors reinforced and “rewarded”. I’m so happy to say Bart & Sadie are well on their way to becoming wonderful members of the family—they couldn’t have found a better home!